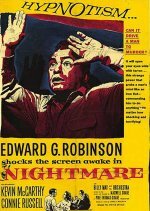 Director Maxwell Shane remade his 1947 film Fear in the Night to produce a much better movie from Cornell Woolrich's original story. Kevin McCarthy gives a good performance as the musician who becomes convinced he's a murderer, but Edward G Robinson is better as the detective who sees the flaw in what appears to be an open-and-shut case. Cameraman Joseph Biroc's moody, black-and-white photography adds real menace to the disturbing idea, and there's a jazz score by Herschel Burke Gilbert that's as jumpy as a neurotic's bad dream.